Chinese President Xi Jinping (R, back) attends a signing ceremony with Russian President Vladimir Putin (L, back) at the Great Hall of the People in Beijing, China. 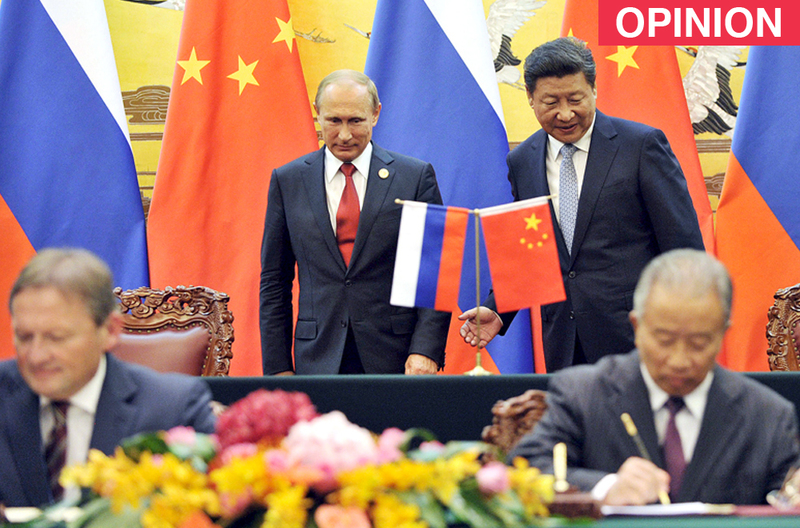 Alexander Gabuev, Director of the Moscow Carnegie Center's Asian Program, has modest expectations from the Russian President’s visit to China in the end of June. At the end of June Vladimir Putin will visit China. The visit coincides with the second anniversary of Russia's “swing towards the East,” which was symbolized by the Shanghai talks and the “deal of the century” for the Power of Siberia pipeline. However, over the last two years there is still no answer to the question of whether Russia has been able to build a new model of relations with China. A recent Kommersant article first described the sides' grandiose intentions and then explained why they are destined to remain only on paper. This was the case with the idea of giving the Chinese access to large oil and gas deposits (they did not agree on the prices), substitute Western money with Chinese money (which was more expensive and more difficult to obtain) and build a highway from China to Europe as a part of the Silk Road project (there has not been any news on it for a year). Another example will be mentioned below. Disillusionment has already seeped into the public space when it comes to Russia-China trade ties. During the Russia-China conference organized by the Russian International Affairs Council, policy experts along with Russian Foreign Minister Sergei Lavrov spoke about an unending friendship. Behind the scenes the participants complained that the excessive desire to be friends only created new problems. For example, the companies are forced to run around and present their projects to three intergovernmental commissions, whose authorities are not always defined. The bottom line, according to the Chinese, is that in the last two years the most effective cooperation mechanism has been the personal relationship between Russian President Vladimir Putin and Chinese President Xi Jinping. The warm friendship is perhaps the only reason why large deals are still being made. It is this friendship that is responsible for the success of Yamal LNG attracting a new Chinese shareholder. This camaraderie paved the way for a $12 million loan for the project from Chinese state banks (with very advantageous interest rates for Russia). The relations between the leaders also explain the successful sale of a stake in Sibur to Sinopec, and the agreement to provide credit for Moscow-Kazan high-speed railway without state guarantees. “The Chinese president sees that China cannot help all of Russia's economy, but is willing to help precisely those projects that are important for President Putin,” Chinese experts say. In such conditions, expectations for large deals to be made during Putin's June visit are modest. Chinese banks have enormous resources, but they are not limitless, and they can finance only those projects that belong to the leaders' closest business friends and companies. While investing in Russia, Chinese companies seek profitability, which is hard to come by in times of crises. Read more: Will Chinese factories pollute the Russian Far East?